Using a stand mixer or hand mixer, on medium speed, mix the Nutella, butter, cocoa powder, baking powder and 3 tablespoons of water until well blended. On low speed, beat in half of the flour. Then, beat in the remaining flour just until well incorporated. If the dough is too dry, add a little more water. Scoop out 1-inch dough portions and shape into dough balls. Roll them in the turbinado sugar until well coated. Space them about 2 inches apart on the parchment paper lined baking sheet. Press down the dough balls into 2-inch evenly thick rounds using your palm. Bake for about 12-16 minutes (every oven is different) or until the cookies are barely firm when pressed in the center top. Transfer to a wire rack and let the cookies cool.
) Prepare the raspberry thumbprints: when rolling the dough balls, do the same as noted above and after you have rolled in the turbinado sugar, press a deep indentation into the center of each dough ball with your thumb. 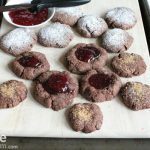 Put the raspberry jam in each cookie and bake an extra 1-2 minutes for these.